Find artworks, auction results, sale prices and pictures of August Heinrich Schiott at auctions worldwide. 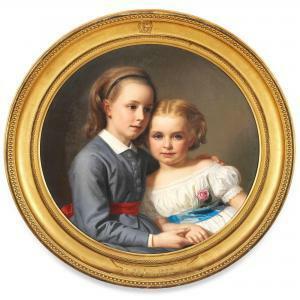 Portrait of Marie Millon de la Verteville (1863-1946) and Dagmar Rose Elisabeth Millon de la Verteville (1868-1945). Signed and dated August Schiøtt 1872. Oil on canvas. Diam. 64 cm. Frame with monogram D for Dagmar and G for Marie whose nickname was Genevieve. 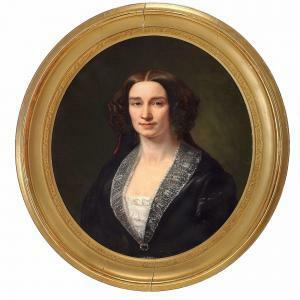 Portrait of Sofie Schulin. Unsigned. Oil on canvas. 77 x 65 cm. Provenance: Tølløse manor house, The Schulin-Zeuthen Collection. Peelings. Minor scratches. Previous framed in an oval passepartout with a four-sided frame. 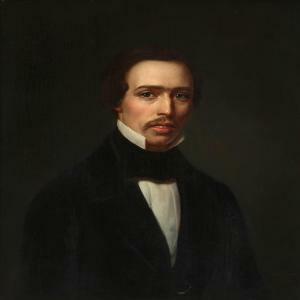 August Schiøtt: Portrait of the Danish painter Vilhelm Kyhn (1819-1903). 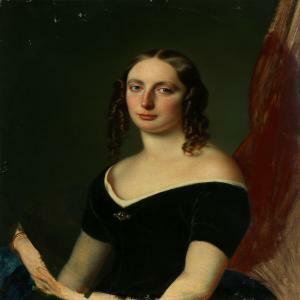 Signed and dated August Schiøtt 1848. Pencil on paper. Oval. Visible size 15 x 12 cm. Portrait of the Danish painter Vilhelm Kyhn (1819-1903). Signed and dated August Schiøtt 1848. Pencil on paper. Oval. Visible size 15 x 12 cm. A pair of portraits of the brothers Ernst and Julius Christiansen, sons of the merchant and shipowner Christian Christiansen (1803-1877). Signed and dated A. Schiøtt,1853 and 54. Oil on canvas. 69 x 55 cm each. (2). In need of a light surface cleaning. Retouches. One repair / patch on the reverse. August Schiøtt: A pair of portraitsof Jørgen Wichfeld (1800-1888) and his wife Warinka Wichfeld(1822-1908). He is wearing a black jacket and a white shirt. She iswearing a black dress with white laces. 68 x 54 cm each. Provenance: The entailed estate of Engestofte. 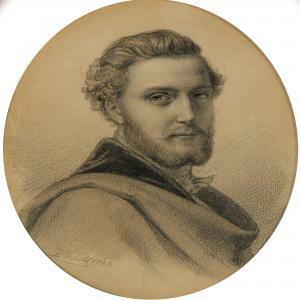 the gentleman's portrait reproduced p.